Trump's anti-marijuana attorney general pick gets a surprise visit from DC activists, the CDC announces that opioid OD deaths went up again last year, British Columbia expands its safe injection site program, and more. DC Activists Visit Sessions' Office, Offer Free Weed. As part of their #SmokeSessions campaign to defeat the nomination of Trump's attorney general pick, activists from the DC Cannabis Campaign, the same group that led the DC legalization campaign, visited the offices of Sen. Jeff Sessions (R-AL) Thursday, carrying marijuana with them as they went. Sessions staffers listened to arguments against prohibition and stories about medical benefits and did not call Capitol Police to arrest the federal lawbreakers, leading organizer Adam Eidinger to ask: "If you're not going to arrest people in your own office who bring marijuana… why would you break down people's doors as a federal policy?" Missouri Hemp Bill Filed. State Sen. Rob Schaaf (R-St. Joseph) has pre-filed a bill that would authorize commercial hemp farming, production, and sale, and does not require growers to get federal permission to grow their crop. The measure is SB120. The legislative session starts next month. Opioid Deaths Surpassed 30,000 Last Year. The Centers for Disease Control and Prevention (CDC) released data Thursday showing the opioid overdose deaths had surpassed 30,000 for the first time in recent history last year. That's up nearly 5,000 deaths over 2014. And for the first time since the 1990s, more people died from heroin overdoses than prescription opioid overdoses. "The epidemic of deaths involving opioids continues to worsen," said CDC Director Tom Frieden in a statement. "Prescription opioid misuse and use of heroin and illicitly manufactured fentanyl are intertwined and deeply troubling problems." Institute of Justice Sues Border Patrol, IRS Over Asset Forfeiture FOIA Records. The libertarian-leaning Institute of Justice filed a federal lawsuit Thursday against the Border Patrol and the IRS, saying the two agencies are violating the Freedom of Information Act (FOIA). The IRS demanded $750,000 to turn over asset forfeiture records, while the Border Patrol denied the FOIA request, first claiming it was "overbroad" and then saying to do so would reveal law enforcement techniques. "The lack of transparency surrounding forfeiture is deeply troubling, especially considering the vast power law enforcement has to take property from people without so much as charging them with a crime," The Institute for Justice's research director Lisa Knepper said in a press release announcing the suit. "The public ought to know how forfeiture is being used." Ohio Asset Forfeiture Reform Bill Heads to Governor's Desk. A bill that would require the filing of criminal charges before the state could institute civil asset forfeiture proceedings won final approval in the House Friday and now head to the desk of Gov. John Kasich (R). The measure, House Bill 347, was earlier approved unanimously by the state Senate. New Safe Injection Sites Open in Vancouver, with More Yet to Come. Two new safe injection sites for drug users opened in the city's Downtown Eastside Thursday, and similar facilities will open in Surrey and Victoria next week. And later this month, additional sites will open in all three locations. The move was announced by the British Columbia Ministry of Health, which did not seek permission from the federal government to do so. But they did let Health Canada and the Ministry of Public Safety know it was coming. BC Health Minister Terry Lake said the actions were necessary to combat a rising toll of opioid overdose deaths. "We can't wait for federal changes in order to save people's lives," he said. "We know people are using in alleys, they are using in their rooms, and they are not where the people who can help them are. And so in the face of this crisis, we really just wanted to do more." Germany's Dusseldorf Wants to Legalize Weed. Following the lead of Berlin, which is moving to allow cannabis coffee shops, the city of Dusseldorf is moving to enact total marijuana legalization. The city council met Wednesday with experts in crime, economics, and psychology to discuss how best to move forward. Remarkable story about DC activists at Jeff Sessions' office. Hats off to the activists! But really, it's just best, I think, if he is not confirmed at all. That way, we don't have to find out how bad it might be. Almost anyone else is likely to be a better choice. Or, leave the post vacant! 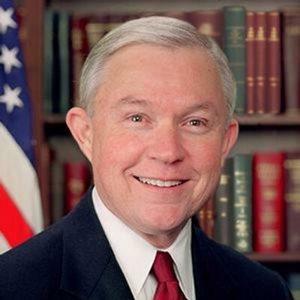 Seems to be all the rage these days... No AG is better than a Jeff Sessions AG!!! !